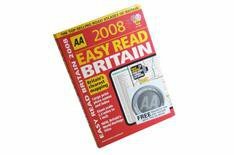 6th AA 2008 Easy Read Britain 14.99 | What Car? The 1:148,000 mapping on A4 pages provides excellent detail, with extra clarity provided by the larger-than-normal place and road names. However, there is a downside: the large lettering does leave denser areas littered with writing, and the pages looking cluttered. There are no close-up town maps for extra guidance, either. This atlas is presented in a plastic-bound cover that falls open easily, ensuring there are no problems with crucial map information falling into the seam. All the basic map information is here, although we'd prefer to see the speed limits marked next to the speed camera locations. The plastic-bound cover provides a happy balance between practicality and durability, providing a sturdy exterior without compromising your ability to see all the map detail inside. Our only quibble would be with the quality of the paper - it feels thin, and could be prone to ripping. Speed cameras are marked accurately, but there's no indication of the speed limits at those locations. Tourist sites, including Britain's World Heritage Sites, are marked. Other information is sparse, although deals with Ikea, Burger King and KFC means these outlets are highlighted.